We were having a lazy morning yesterday, in the sunny, warm conservatory, and Andrew was playing The Beatles 1967-70 on his turntable, when “The Fool on the Hill” started playing. I love this song. I do understand why people tend to idolise John Lennon, with his experimentation, controversial ideas, and clear gift for originality, but I would insist that McCartney is the more melodic of the two, and his songs have aged much better and are much more memorable as tunes. “The Fool on the Hill” is a clear example of his talent, and so is “Blackbird”. But listening to “The Fool on the Hill” on a lazy weekend morning, my mind made a link that is as unjustifiable as it is intriguing and seductive. I thought of Tolkien’s very early drawing, from a sketchbook he had named “The Book of Ishness”, called “End of the World”. This drawing depicts a stick-man happily taking a nice, big stride, without (apparently) realising that he’s stepping over an enormous cliff. And, as a chain reaction, yet another image came and collided with Tolkien’s and with the lyrics of McCartney’s song: the “0” card from the Major Arcana of the Rider-Waite Tarot deck, “The Fool”. J.R.R. Tolkien’s “End of the World” (in J.R.R. 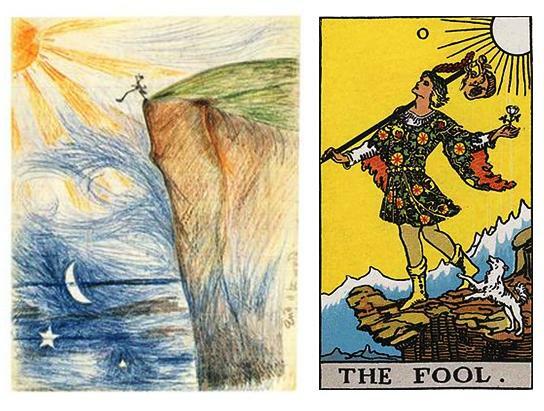 Tolkien: Artist and Illustrator, by Hammond and Scull) and The Fool from the Rider-Waite Tarot deck. Now, Tolkien’s drawing is most probably a rather lighthearted representation of his early conception of Arda (the larger world of which Middle-earth is just a part) as a flat world, surrounded by the Outer Sea. One could potentially walk all the way to its end and literally fall off its edge. Tolkien changed his mind later with the story of the fall of Númenor leading to the notion of the World Made Round. But Narnia, for example, which was also inspired by medieval representations of the world, remained flat. Nevertheless, the carefree, completely oblivious sauntering of the stick-man (you can’t wipe off my mind the idea that he is sporting a “foolish grin”) makes me think every time of “The Fool of the Hill”, who “sees the sun going down/ and the eyes in his head/ see the world spinning round”. Tolkien’s drawing even features a whirling, spinning sky (in a style that has been compared with Van Gogh’s) with the sun’s light merging with the night sky, complete with moon and stars. As for the Fool from the major Arcana, he’s looking up and can’t see the precipice in front of him, much more interested in spiritual rather than earthly things. Will he plunge into the abyss, the victim of a naive approach to life, or will he fly and defy the pull of gravity? Poised in this position, full of doom or potential (depending on one’s view), he is a symbol of Everyman at the beginning of life’s journey. Or is it at the end? If memory doesn’t fail me, the Fool is either card 0, before even the beginning of numbering, or card 22, the very last one. And so we come back full circle to Tolkien’s idea of the “end of the world”. Three “fools on the hill”, three travellers in life (or a secondary world), three symbols/metaphors? I am most certainly not claiming any direct links between the three (though the Rider-Waite Tarot deck dates from 1910, if I have it right, and Tolkien’s drawing was done in the 1910s too, while one can’t imagine that the Beatles wouldn’t be familiar with the tarot cards, given their cultural milieu). No, I’m not claiming direct links (that’s why I have resisted “researching” these musings, and adding references, as I usually do), not even indirect ones, in fact! Pray accept this blogpost as random reflections by free association on a lazy weekend morning. Don’t forget Tolkien’s other “off the edge of the world” figure, Éarendel/Eärendil, whose journey launched the whole Middle-earth enterprise in 1914! Despite aspects of heroism, in the first poem, and in his later connection with the poem “Errantry”, he is a bit of a fool too. I hope Paul McCartney gets to hear of your musings; I think he’d enjoy them. I certainly did.